When the Denver Broncos begin mandatory minicamp on Tuesday, All-Pro left tackle Ryan Clady won't be there. 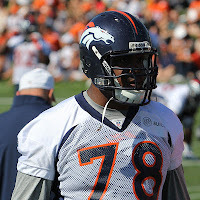 Clady (26, 6'6", 315 pounds) went on the Les and Tom Show on 102.3 ESPN Denver on Monday and said he will not attend camp, noting "I wouldn’t be participating anyway," due to his ailing shoulder. Clady is recovering from shoulder surgery and is refusing to sign the one-year $9.8 million franchise tag the team placed on him earlier in the year. Because he is not under contract, Clady will not be fined for skipping camp. Clady has until July 15 to sign his tender. After that deadline, he will no longer be able to negotiate a long-term deal with the team (only one-year deals can be agreed upon with franchised players after the 15th). But it doesn't sound like the Broncos were planning on giving Clady a multi-year deal anytime soon, anyway. The Broncos and Clady's rep have not negotiated on a new contract all year. Team wants to see how his shoulder recovers. The Broncos hold all the cards, and waiting to see how Clady recovers from injury before giving him a huge contract is a wise move. But it is a move with which former Pro Bowl center Tom Nalen disagrees. "Yes, let's look for a top three tackle in the NFL for 2014 or 2015. Brilliant." Nalen's response was obviously a condescending one, as he points out that Clady will be free to sign elsewhere in 2015 if the team does agree upon a long-term deal with the veteran left tackle (the Broncos can use their franchise tag on Clady again in 2014, but are restricted from using a tag on the same player in three consecutive offseasons). Ultimately, the Broncos still have time. But in the meantime, Clady won't be showing up for minicamp and he may not show up for training camp, telling 102.3 that he is "not sure" if he'll show up in late July. "More than likely I’ll be there," he added. At the end of the day, the Broncos want Clady to stay in Denver. If the feeling is mutual, something will eventually be worked out (but perhaps not until next offseason). As Jones noted, Clady will be paid somewhere. The Broncos will be scrambling to find a replacement to protect quarterback Peyton Manning's blindside if Clady gets his money somewhere else. July 15 is 35 days away.